Its a topsy turvey world that we inhabit as curlers when in the morning you feel elated to have put a difficult team away and then at night you feel totally deflated after losing a really important game only to be lifted again less than 24 hrs later with an excellent performance to record another win. So it was yesterday and today. After my report on the Latvian game we came out somewhat flat for the evening game against Japan and allowed ourselves to be drawn ( literally ) into playing the game their way and we were unable to impose ourselves on it at all until the break. We fought really hard to steal 4 ends in a row but only singles and in the last end we again had a chance to get our last stone behind a cover stone only to see it rub the guard fractionally and stay in the open. A nose hit from the Japanese skip sealed the win for them. In truth we didn’t pay that badly but every rub seemed to go against us – it was one of those games. We decided a chill out beer was required – well catching up on FB and messages from home really; the beer was someone else’s! A new day dawned this morning – chucking it down again. We had a minor soaking yesterday after lunch while leaving the Italian restaurant on campus. We were being chased by the waiter at the time who claimed we had short changed the payment of the bill!! Sir Hume is the kittymeister so inevitably got the blame although we are not entirely sure that he wasn’t ‘at it’ to quote T Tierney. On that note the food and facilities are good on the whole and thankfully also reasonably priced thanks to the weak Rouble. Breakfast is a refectory style buffet – reminiscent of boarding school mealtimes ( for Bill anyway). 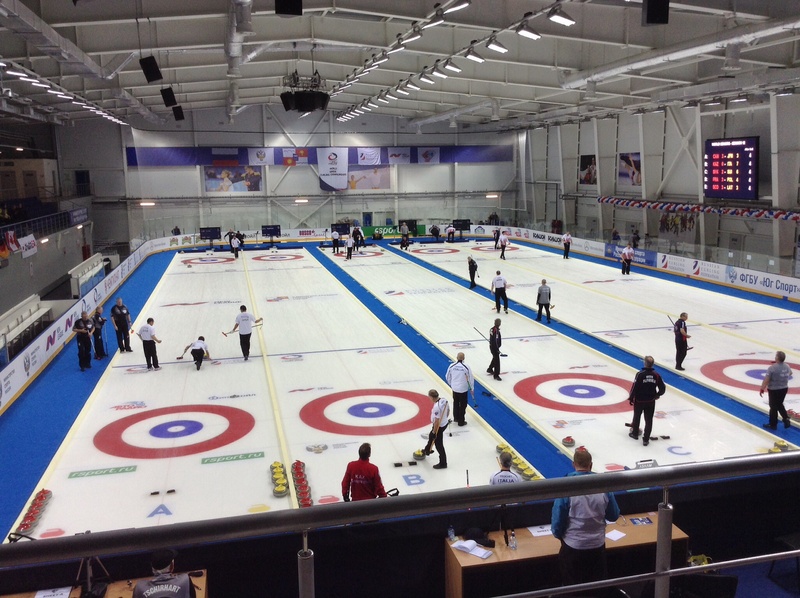 We managed to take in some of the Mixed Doubles today before our 4pm game against the Czechs. The ice for the MD is undoubtedly superior to ours as it has a more normal swing but our arena has a much better atmosphere. David W has commented a few times what a buzz it is to curl in an Arena such as the Skating Palace and I’m sure David H feels the same. Bill and Neil have been fortunate to experience it before but both agree that they are a bit disappointed with the way the ice is playing – although it’s definitely improving and it may be that the stones are causing the slow surface and excessive swing. The facilities, the welcome and the work of the organising committee has been excellent as has been the shuttle transport. The security checks are normal for Russia but we caused a bit of a stir trying to bring our Jameson miniatures in to gift to our opponents. Nyet to alcohol was the comment. Suffice to say we have resolved the problem……..initiative is our middle name. 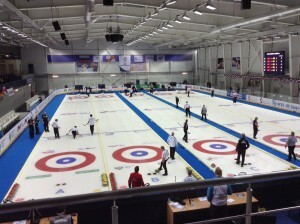 Back to the curling briefly; we played really well against the Czech team today – managing to do everything we had failed to do yesterday evening. We called the game well and executed our shots well and ran out comfortable winners 11-3. We are now set up to take on Canada tomorrow. There were some really close games in tonight’s session which saw Canada narrowly defeat Japan and Latvia play a great inwick to score 2 in their final end against Scotland to record a 1 shot victory. This tightens up the group which makes our remaining three games crucial to our qualification ambitions. One at a time, tho and we are ready for Canada tomorrow. 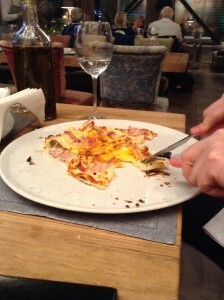 Even more so now that David W has carb loaded following a Carbonara Pizza!! Yep, seriously folks!! Here it is!! finally huge thanks to all who have sent messages of support to the team. We really appreciate them. 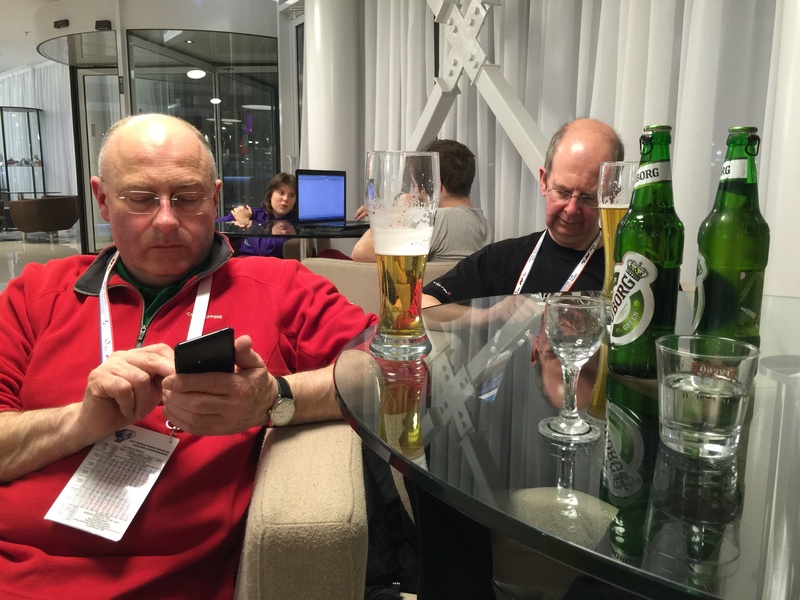 This entry was posted in Event Blog by Bill Gray. Bookmark the permalink.